It’s hard to believe that the former Jurassic 5 DJ/producer is releasing his debut this late into his career, and it shows with his dedication to keeping his old school aesthetic alive. 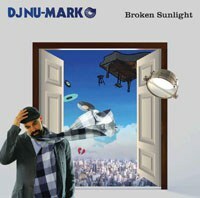 For some reason, DJ Nu-Mark has gone back to his past and his roots in old school golden era hip-hop. After all, it’s how he made his name with Jurassic 5. Polished drumbeats overlaid with samples from traditional hip-hop sources became the blueprint through four old-school enthusiast beloved albums. While other renowned turntablists have ventured into more experimental works in their album releases, including former production partner and Jurassic 5 member Cut Chemist, DJ Nu-Mark has only slightly altered his blueprint. This album does push forward some atypical cuts in its sampling and utilizes his turntablist techniques; however, it’s still crafted through that established traditional hip-hop mindset. A collection of five individually numbered eponymous 10-inch vinyl releases, Broken Sunlight is the consolidation the series’ tracks with the addition of “Tough Break”. Through this format, DJ Nu-Mark’s vision comes into clear focus. The scratch work, drum work, and sample choices indicate an artist who still believes in the power of old school hip-hop principles as an aesthetic, independent from the ever-growing engulfing influence of avant-garde producers. This is not to say that the work lacks individuality. On the contrary, its dedication to maintaining that concept is refreshing to hear. In a way, by going back to that aesthetic, he is able to go against the status quo. The current milieu is filled with producers trying to mimic Clams Casino and Lex Luger. While all the tracks create an enjoyable and eclectic mix, certain aspects lack imagination. Going through some of the tracks is like listening to a history lesson. At certain points, as a listener, you feel like you’re being lectured on hip-hop’s foundations. The James Brown vocal samples on “Don’t Play Around” are an integral aspect of the track, but feel preachy as much as it pays respect. The Nas and Raekwon vocal samples on “Times Is Rough” are predictable. His take on “Our Generation”, instantly recognizable as the sample used by Pete Rock for “Straighten It Out”, feels out of place. While some hip-hop heads will absolutely love it, coming from such a well-established producer whose pride in his record collection is legendary, I was expecting more unusual and rare fare. With that in mind, the Latin based “Tropicalifornia” and “Oya Indebure” provide a relief from the first 10 conservative tracks, seeming adventurous when juxtaposed to the former. And, of course, regardless if the first 10 tracks are innovative, they are solid, fun pieces of work that will get your head nodding. The overall drum work is a nice heavy anchor while the samples, consisting mostly of R&B, funk, and soul, vary enough to keep you listening. Of particular interest are the horns on “Never Be Wrong”, as they complement Haas’ flow and inject soul adrenaline into the heart of the album. Even though his live set has revolutionized the art of turntablism, his production is bent on keeping the golden era in the consciousness of hip-hop heads and that is not necessarily a bad thing, as DJ/producers try too hard to delineate the boundary between the art of turntablism and the production work they do for emcees. These albums become the vehicle for their creative ideas and, often, are too austere in their outlook. DJ Nu-Mark happens to find a comfortable place in between, leaning more towards the fun side, letting his guests do work. It’s a product of his golden era outlook. He shows that there is still art in the sample and the drumbeat, as well as the interaction between a DJ and emcee. But this album is about more than that though. It’s also a document framing traditional hip-hop production in the modern context. DJ Nu-Mark serves as a bridge between the golden era and today, just as Jurassic 5 did. It’s an easy listen and it’s a nice divergence from his world-class live sets, which are technically stunning and entertaining but hard to digest in CD format for the casual hip-hop listener.